“Only recently has anything approaching a comprehensive account of the massacre become possible. 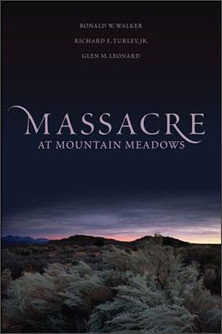 But no one has done a more thorough, even-handed job of reconstructing the killing and the complex events that surrounded it than Ronald W. Walker, Richard E. Turley Jr. and Glen M. Leonard in their riveting new book, Massacre at Mountain Meadows . . . The three bring to their subject unusual expertise as well as a sympathy for the Mormon cause that renders their unflinching telling of this awful story all the more persuasive.” Read more here.